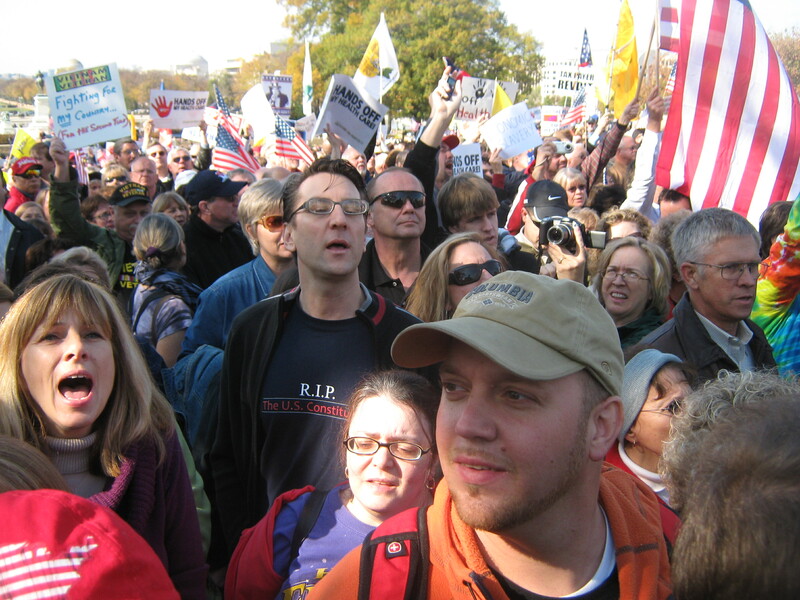 While in downtown Washington on November 5, I noticed that people were starting to gather for some kind of protest on Capital Hill. Sensing a potential “storm” brewing, I went to the scene. 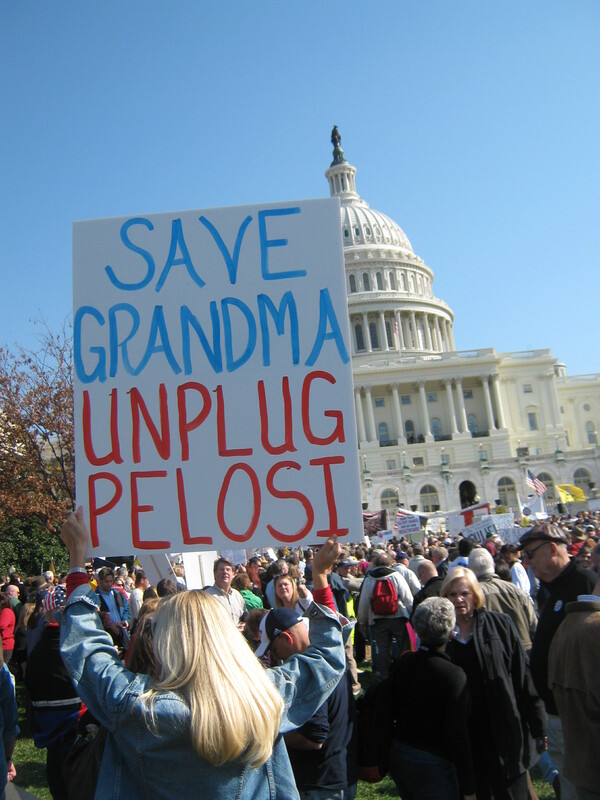 By about 9:30 a.m, people of all ages were gathering to protest President Obama’s healthcare reform, and a line of buses began swarming Capital Hill. Many people arrived with handmade signs, and I quickly began to read as many as I could, to try to understand what the opposition to the proposed health reform was all about. 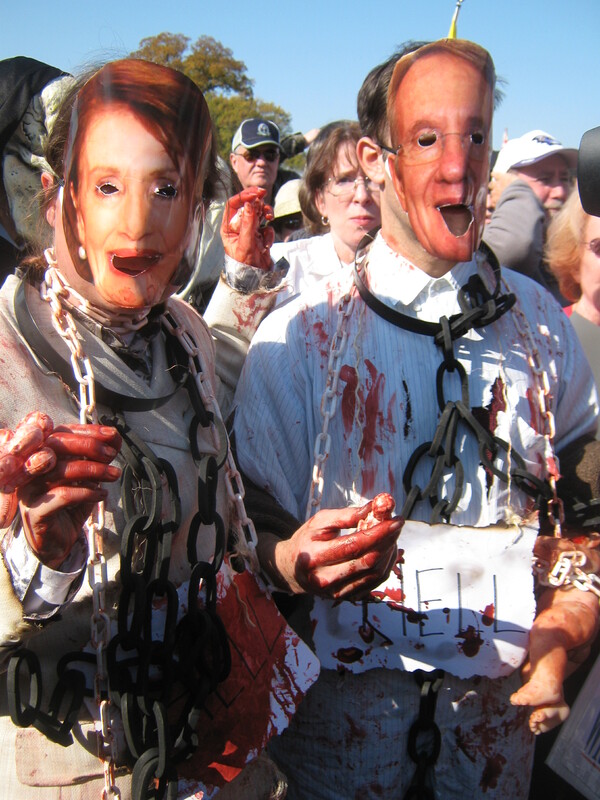 One young blonde haired white man held up a sign saying, “Abortion is not health care.” Two people were dressed up as Nancy Pelosi, and Harry Reid, with blood stained clothing, carrying baby dolls and fetus like plastic shapes. It was a rather shocking and horrific image. Cameramen snapped photos of them. The crowd began chanting-“Nancy, can you hear us now.” This crowd said it did not want the federal government, directly or indirectly, funding abortions in any way. The crowd was polite, and at times began singing God Bless America, as a huge American flag was held over people’s heads. I pressed up against hundreds of people to get to the front of the demonstration, where a man with a loudspeaker was announcing, “We’re going to have ourselves a good old fashioned sit in at Nancy Pelosi’s office. It’s office number 225. We’re going to bring her all 900 pages of the health care bill, and start ripping them up one at a time. 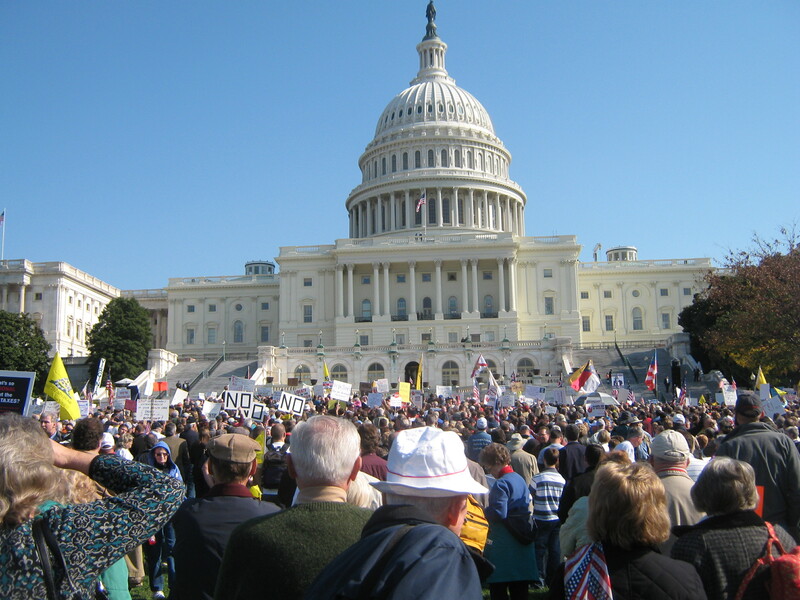 You’re all invited to participate—as long as you don’t mind getting arrested.” Many in the crowd chuckled, and a boisterous chant of “Kill the Bill” began. Just then, two women arrived with a copy of all 900 pages of the health care bill, to be ripped up. Police officers stood on the hill, looking down over the crowd. About an hour and a half later, the lawn was completely filled-with estimates being that 25,000 people were there. Several days later, the Obama health care bill narrowly passed through Congress, but still it must wind it’s way through the U.S. Senate. I thought of the memorable scene I had witnesses on Capital Hill, several days later on November 10th when I sat listening as Rahm Emmanuel, The White House Chief of Staff, addressed the 3000 delegates at the General Assembly of Jewish Federations in Washington. In his address to the delegates, Emmanuel said, “We are closer than ever to achieving quality healthcare” and “He [President Obama] is fighting for a day when no one loses healthcare because of pre-existing conditions.” Emmanuel received warm applause when making these statements. Those Jewish delegates who attended the General Assembly would never have been out protesting “Obama Care” on Capital Hill. Most American Jews, who voted for Obama en masse, are in favour of his health care reform package. On the whole, they believe that publicly funded health care is in keeping with traditional Jewish values—the need to care for all the vulnerable in society, and the idea of not leaving anyone behind. The State of Israel, of course, has publicly funded health care. When it comes to health care, Obama, American Jews and the State of Israel see eye to eye.